This will take you to all the pages about past, present and future litters. This will take you to articles on training that I wrote. Some of which have been published in various magazines. 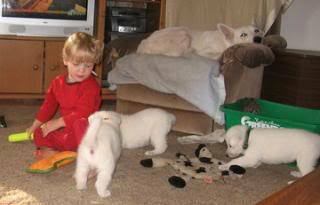 This will take you to various pages on the Service Dog laws in each Canadian Province. Welcome to our Kennel. 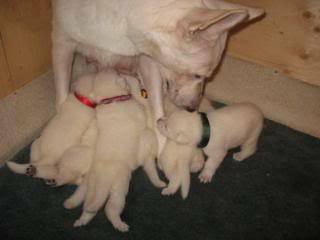 We are breeders of European Imported, FCI registered White Swiss Shepherds or otherwise known by Berger Blanc Suisse's. Our primary goal with every breeding is to produce the finest quality litters that we can when it comes to structure, health, intelligence, drive and personality; so as to donate puppies to be Service Dog candidates to trainers, facilities or the public to be trained to be Service Dogs for the disabled. From every litter we strive to donate at least one puppy that temperment tests at 7 & 9 weeks as a possible Service Dog candidate. Not all puppies will be suitable for our goal. These other pups might be suitable for other work training, sport training, or just a great companion. All our puppies are UKC registered since the CKC does not recognize all FCI breeds.